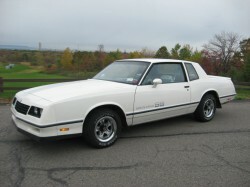 Description: 1983 Chevrolet Monte Carlo SS with 80k original miles. Actual miles and it really shows like it's half of that. This car is in very nice condition inside and out and really is a beauty. It was originally purchased at Kerbeck in Atlantic City New Jersey in 1983. This car has been garaged and covered most of it's life. The car runs and drives great. 305 High Output V8, Bucket seats with SS factory embroidered on the headrests. As you can see from the pictures this car is very clean and it is hard to come by one like this very often. Includes all original paperwork and owner history.